The Algona, Iowa, law firm of Peterson & Lipps assists clients with personal injury and workers' compensation matters. The law firm's record of success in the courtroom has established it as one of the premier personal injury trial practices. Trial lawyer Thomas W. Lipps is certified by the National Board of Trial Advocacy. At trial, he has won both the highest wrongful death award as well as the highest punitive damage award – $500,000 – in Kossuth County District court history. He has also obtained a $33 million dollar jury verdict in an environmental pollution case—reportedly a national record. 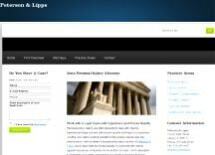 Peterson & Lipps assists its clients by using a team approach to maximize client contact with the firm. This keeps the client informed at all times as to the status of a case. Further, the firm provides lean legal services through the use of the latest technology to gather and process case-critical information as quickly and as thoroughly as possible. To discuss your personal injury or workers' compensation matter with a law firm that sets a standard by which other firms are measured; contact Peterson & Lipps by calling 515-200-2518. Your initial consultation with the firm is free to help you determine whether Peterson & Lipps is a good match for your legal needs.